Knocking down the adjacent wall in their galley kitchen was the Wises' best attempt to make a great room. 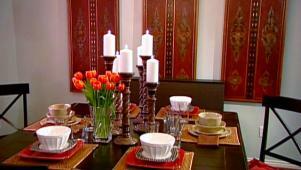 However, Dana and Kerri hit another wall when it came to decorating and designing three spaces as one cohesive room. With feedback from HGTV.com's Rate My Space community, they're ready to start by creating a casual gathering area that balances their overstufffed furniture and their clean, contemporary kitchen. Additionally, Kerri would like to incorporate more contemporary elements throughout without losing comfort and practicality. Traditional, modern, contemporary, so much to choose from. Host Angelo Surmelis and his team are ready to guide them through.